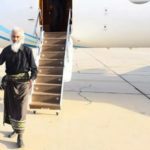 Indian priest Father Tom Uzhunnalil, recently released from 18 months’ captivity in Yemen, received a rousing welcome as he arrived home to the southern state of Kerala, a Christian stronghold, yesterday morning (1 October). Over a dozen senior political leaders from a range of parties, and dozens of media personnel, joined many Christians, including two Catholic bishops, in receiving the priest, who was kidnapped from the Missionaries of Charity centre for the elderly in Aden, in war-ravaged Yemen, in March 2016. “I am really happy to return to my home state. Thanks a lot for all your prayers,” the priest told the enthusiastic media contingent at the airport exit, after he had received garlands and bouquets of flowers inside the terminal. When Father Uzhunnalil reached the Major Archbishop’s House in Ernakulam, dozens of media people were there too. As he entered the St Mary’s Basilica, the 59-year-old priest was swamped by the media, while the congregation applauded. It had been inside that same Basilica that special prayer events had been held for Fr. 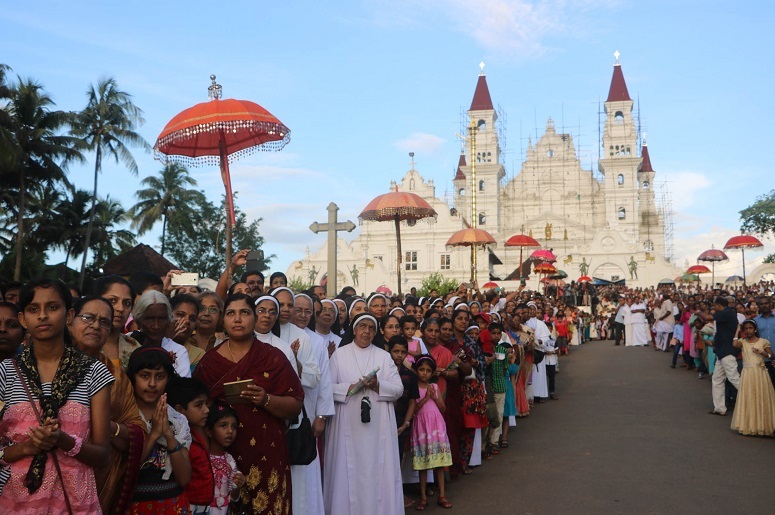 Uzhunnalil, led by Cardinal George Alencherry, head of the Syro Malabar Church to which he belongs. 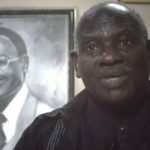 “Nobody had pointed a gun at me during my captivity… They never tortured me. 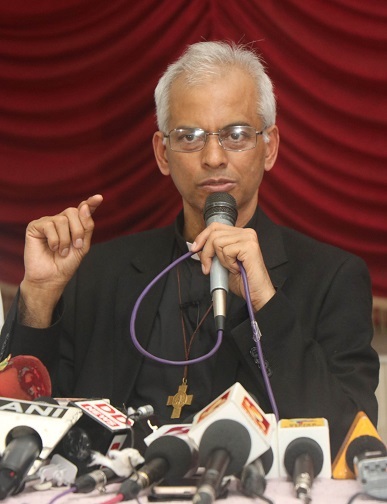 They gave me food three times a day even when they were fasting for Ramadan,” said Father Uzhunnalil, at his crowded news conference, which was telecast live by rival news channels in Kerala. He also clarified that his distressing video appeals pleading for intervention were “forced”. 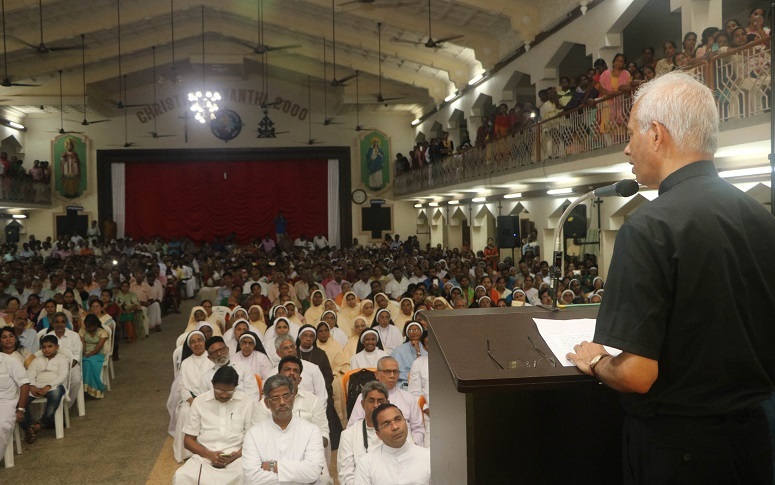 In the afternoon, the Salesian priest was driven to Palai, 70km from Kochi, for a reception at the bishop’s house, with dozens of priests, nuns and others. Recounting his days in captivity, he again thanked everyone for praying for him, including Hindus and Muslims. “Because of your prayers, God touched their hearts and they never tortured me. You all have brought me back from God with your prayers,” he said, his words applauded by the audience. 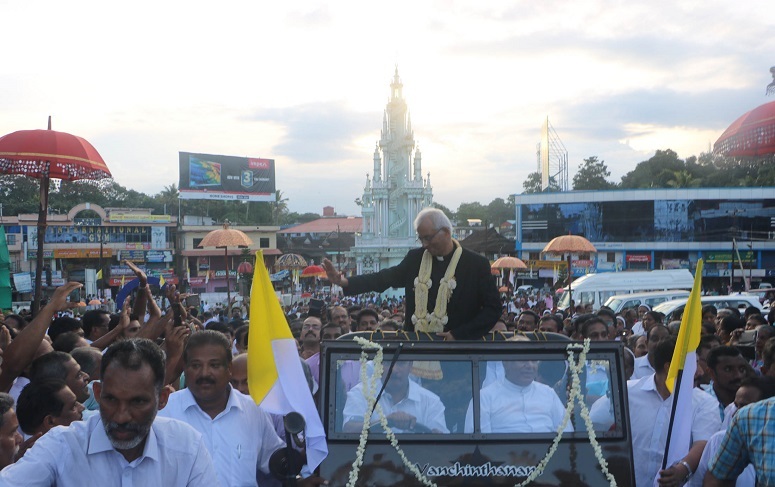 Later, the priest was driven in a motorcade of over 100 vehicles, including bikes and cars carrying his picture, along the 11km road to Ramapuram, his native parish, where thousands had queued hours ahead for a glimpse of the priest. Fireworks were set off as he stepped out of the van in front of the five-storied chapel at the entrance of the historic church, to which he was driven in an open-topped jeep, decorated with flowers. “Thank God!” shouted elderly women in the crowd, as younger members of the crowd waved and held up their mobile phones to take photographs of the priest. 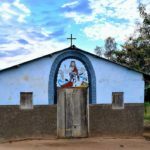 The police struggled to clear the path for the jeep, as many outstretched their hands and the visibly exhausted priest obliged them by shaking their hands and blessing infants on their heads. “I do not have words to describe what I see. He was dead and has now come back like after resurrection. We have got him back, God is great. We were praying for his release every day,” one of the priest’s neighbours, Chinnamma Puthiyedathukunnel, told World Watch Monitor with tears in her eyes. She recounted how a five-year-old Tom had complained to her about her husband pinching him. After the thanksgiving Mass led by Fr. Uzhunnalil and attended by thousands, it was time for a public reception in the auditorium, which was packed to capacity. “I am amazed at the way he withstood the ordeal. His strong faith has seen him though,” Orthodox priest Thomas Thomas, who spent time with Fr. Uzhunnalil in Yemen before his kidnapping, told World Watch Monitor. Rev. Thomas recounted how Fr. 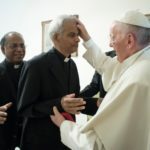 Uzhunnalil had supported him during his time in Yemen, and had helped some of the stranded Orthodox Christians in Yemen to leave the country as it descended into violence. 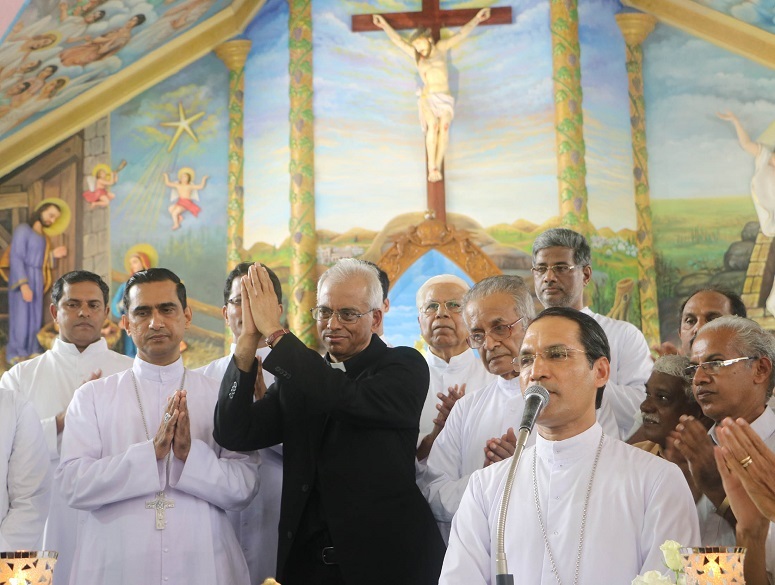 As he addressed his relatives, neighbours, friends and other parishioners, Father Uzhunnalil choked up when he referred to the bloodshed at the Aden centre where served. Sixteen people, including four nuns, were shot dead before he was driven away to captivity in the boot of a car. “All of us have a mission in life. We must fulfil that role,” he added. 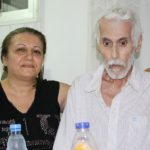 Later he was taken to his ancestral home, where his family, including eldest brother Mathew and sister Mary, received him as he spent a long-awaited night back home. Now begins a new captivity: “Fr. Tom into the captivity of Love of his homeland” read the headline in Malayala Manorama, Kerala’s largest daily, this morning (2 October).